It’s been 12 months since we reported that 2015 was Microcosm’s best year ever (and not just financially). Well, we are stoked (and relieved) to report that 2016 was even better than that. Since last January 1, we’ve published 24 books, 6 zines, a box set, and an LP/book set. We are slowing down a bit for 2017 for the sake of our blood pressure and because we feel that less is more most of the time, especially when you want each title to have time to shine in the light for a bit longer. Nonetheless, our production schedule is filling up through 2022 and we are currently working on 2018 titles with the remainder of this year ready to go to print tomorrow if need be! We had more big staff changes this year. Taylor moved to the East Coast to go back to school and Cyn was promoted to publicity director. Thea now celebrates her devout love of paperwork at the City of Portland overseeing pavement maintenance and after four years of back and forth, we finally got Jeri Cain Rossi to come on board as sales director. And we also convinced our former interns Sidnee and Tomy to work for us as a production assistant and marketing and editorial assistant, respectively! In addition, we hit the road for many events and author tours, including our final Dinner and Bikes tours in May and November. We sold about 142,000 books last year; about 389 per day! So we each took a few days off. Our total income for the year was $495,110.28 (a 5.6% increase from 2015). Here’s a pie chart that shows where that came from. “Other” is mostly the ever-popular Slingshot planners. You might notice that the Top 3 are from 2008, 2001, and 2013 respectively. One major change in 2016 is that sales are continuing to democratize quite a bit more. We used to have one stand-out bestseller every year that paid all of our bills. That hasn’t happened since 2013 and now every book reliably sells within a certain window. Join us next week for a deeper look into The Microcosm State of the Industry Report! 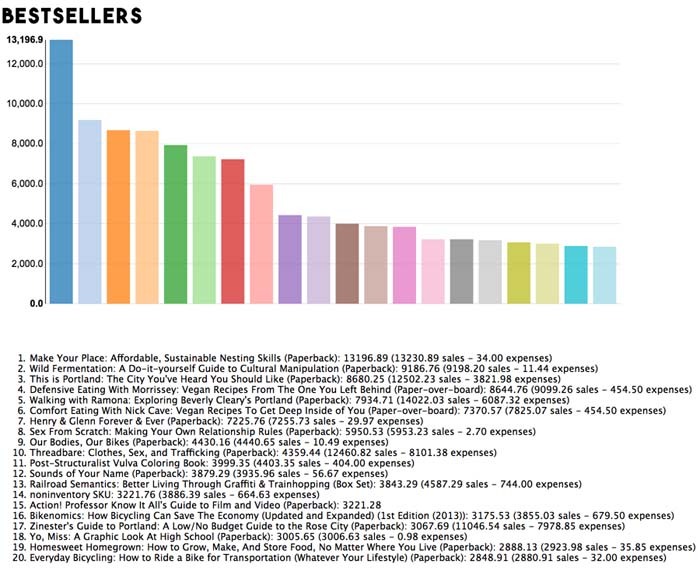 We are also working on a new chart about where our things are selling. 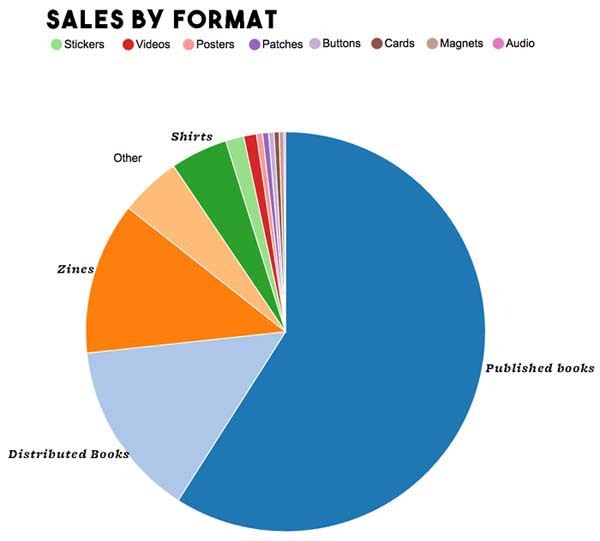 Publishing has changed quite a bit in the past 21 years and book store sales have been flat for a long time so book sales are migrating to different and interesting places. Stay tuned for next year! And here are our expenses. We also donated $34,575.00 (17.1% increase) worth of books to awesome causes last year! Total Expenses: $529,468.09 for a net loss of $-34,357.81. Fortunately, by utilizing the magic of the 75-day payment window that our credit cards offer free of charge, we can afford all that we are up to and more. Among other revelations, we sent out way more packages this year than 2015 and were able to upgrade many outdated office computers and phones. And just a reminder: While we’re technically set up as a “for-profit” organization, we choose to operate on a break-even basis. This means that any time we manage to out-earn our expenses (which we try very hard to do), we put that money back into the company, usually in the form of staff wages and publishing more books—which is the only reason why our wages keep going up in an industry where they are declining overall. 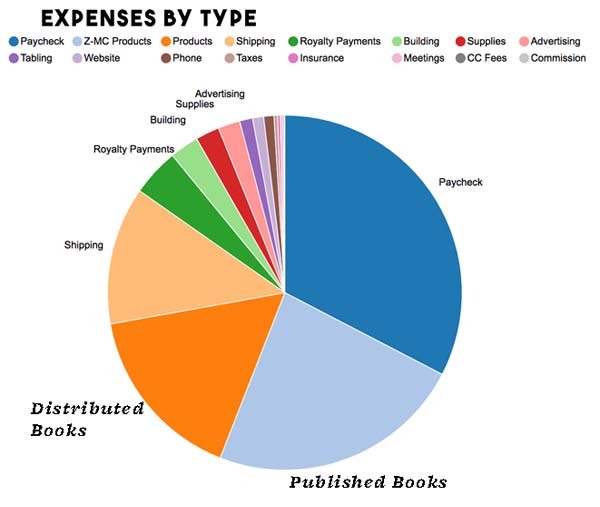 The publishing industry doesn’t have a lot of extra money floating around, but by taking data and math into consideration in every decision, we’ve carved out a little place in it where we can publish the books that matter most to us and keep them priced affordably. Thanks for being along for the ride! We’ll be saying this a lot in the next few months, but 2017 is our 21st year of publishing, and we like to think that we are more fun than a beer. We come to work every day excited that we still get to do this—so thank you for being part of making it work. We can’t wait for the years to come! In the meantime, the best ways to support our staff’s wages and keep new books coming down the conveyor belt is to become a BFF and/or support our Kickstarter project for our Spring titles!